Fine. 0553813536 ALL BOOKS SHIPPED WITHIN 1 DAY OF PURCHASE! Very Good. The Chicago World's Fair of 1893 and its amazing 'White City' was one of the wonders of the world. Burnham, the driving force behind the White City, the massive, visionary landscape of white buildings set in a wonderland of canals and gardens. B-format paperback. 496 p. B & W photos. This is a fantastic work of historical non-fiction. Erik Larson's write style reads like fiction due to his in depth research into his subjects. This book is a tale of victory against almost insurmountable odds. It focuses on the design, building and presentation of the Chicago World's Fair. 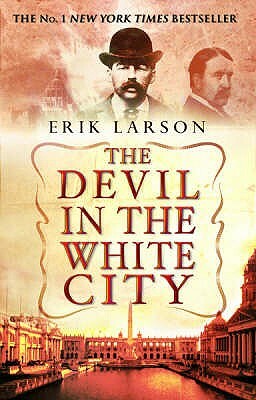 The book also tells the chilling story of a insane serial killer who just might be the devil himself. The juxtaposition of the two main characters, Frank Burnham and Mr. Holmes, is both intriguing and chilling at the same time. Do yourself a favor and pick up this little glimpse of forgotten history. You'll be happy you did. It's ironic that I can't find the words to fully describe how amazing this book is. It's a tour de force of literature. It carefully weaves the story of the 1983 World's Fair (where pretty much everything ever and everyone ever came together in Chicago) and the diabolical HH Holmes. I expected the story of HH Holmes to be wildly more interesting than building some dumb fair. I was so wrong. These historical figures come to life in such a way that when you finish the last page, I hope you don't have any heart conditions and you're sitting down. This book is like a punch in the gut. HH Holmes is the most believable, well rounded villain I've ever encountered. You're almost suckered in by his charm, even after you know his secrets. The fair quickly becomes your own labor of love. You watch as this Americans try to compete with the Eiffel tower - and what they come up with was shocking. This book is fantastic. If you're still thinking to yourself "well, maybe..." no. Buy it. If you're looking for a gift for anyone, buy it. Trust me. The story of how America's most prolific serial killer used the nations greatest engineering accomplishment to carry out his nefarious deeds. Murder, ambition, intrigue, and the indomitable American spirit juxtapose perfectly in this tale of both the good and evil within man. Every detail has been painstakingly researched and the narrative crafted with ever growing suspense and bewilderment. Nearly impossible to put down.